How many of you watch the show "Fixer Upper" with Chip and Joanna Gaines? Answer: All of you! They are the hottest design couple on HGTV. I love Joanna's style and Chip's crazy antics on the show. Although, eating the roach was an ultimate "gross out" for me. Last Friday, my friend Connie and I went on a "Thelma and Louise" road trip to Waco, TX. No, we did not pick up Brad Pitt along the way. :-) We went to specifically shop in the Magnolia Market and Junque in the Trunk stores. I highly recommend these two stores. There is such an eclectic blend of items and no matter what your style, you will surely come home with something. I am excited that the Magnolia Market will be moving and expanding their store to a new location in Waco -- the Magnolia Silos. You can read about this expansion on their website. What a great place this will be and the silos just add so much interest to the location. We also found another little antique store that had some lovely items. Below are some of the items I purchased on our Waco road trip. The wire basket and wooden pails will look very nice on my screened in porch. I hope to find some lovely dried hydrangeas for the pails. Connie also pointed out that the larger pail will be able to do double duty as a wine chiller when we have outdoor parties. See, this is why you take friends with you...to point out the obvious things you might miss! The black pedestal will have a new home on my dining table, along with my coverless books. I believe the contrast of texture and color will make an interesting arrangement. 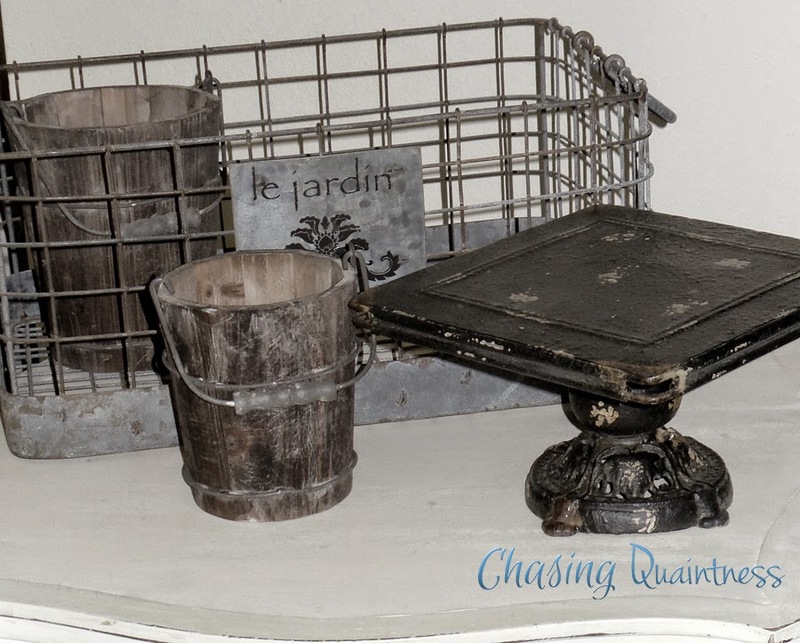 This metal wire shelf and book sign (below - from Junque in the Trunk) will have a new home in the guest bathroom, along with some books for filler and interest. I love old books and they always seem to find their way home with me. I know you are probably wondering what my plans are for the old paintbrushes. Once my treasures are settled into their new space you will be able to see how they are being used. They will be comfortable and well taken care of. Old paintbrushes are "all the rage" in some decorating circles and I think they add some visual interest sitting in a place where you normally would not find paintbrushes. I will post additional photos of my road trip finds once they are in their new homes! Oh boy, what fun we had...........even though we didn't get Brad Pitt. Both shops had an eclectic variety of wares to choose from and YES, I bought something from each of the shops Magnolia Market and Junque in your Trunk. First stop was Magnolia Market, a very quaint little shop. Smaller than I had expected but it did not disappoint. My intention was to find an old wooden dough bowl to display hydrangeas on my kitchen table this spring. While I did not find a dough bowl, I did find a rustic tray that I plan to play with. If I would have had a vehicle that enabled me to haul furniture, Junque in the Trunk would have been my demise. Found many pieces that I would love to have. 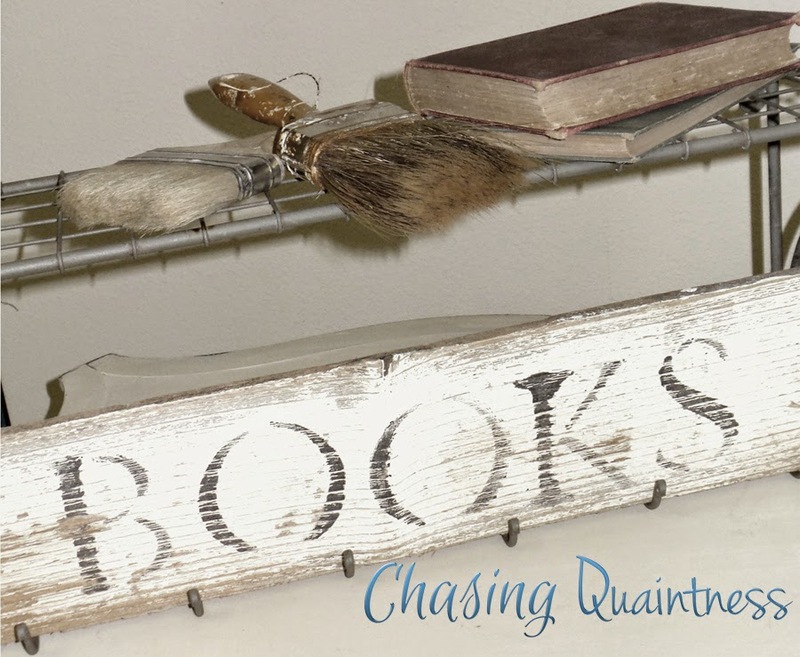 While I only purchased a sweet saying hand painted on cut fence boards, I came back with many ideas and the intention of going back WITH a vehicle for furniture! !